Gaiters that is. 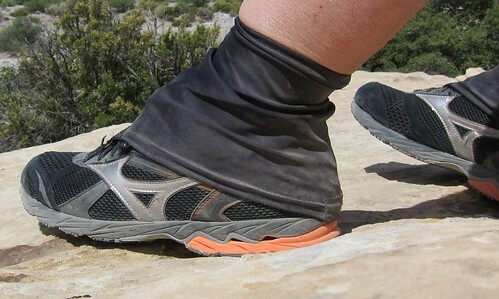 In all the time I've been hiking with trail junk filling my shoes, I've never tried out a pair of gaiters. Then I found Dirty Girl! Dirty Girl Gaiters are about as simple as you can get, which makes them perfect for UltraLight Backpacking. The website, www.dirtygirlgaiters.com is quite amusing, and they have lots of different patterns and colors to choose from. In fact, at first it appeared to me that they didn't even offer plain black gaiters, but I picked up a pair of "i do not make black gaiters" color in a men's 12.5-13 for $17 US including shipping. I've been using them for the past couple of weekends now and had no idea what I was missing! They attach in the back with a small piece of velcro that you cut and stick to the back of your shoe. 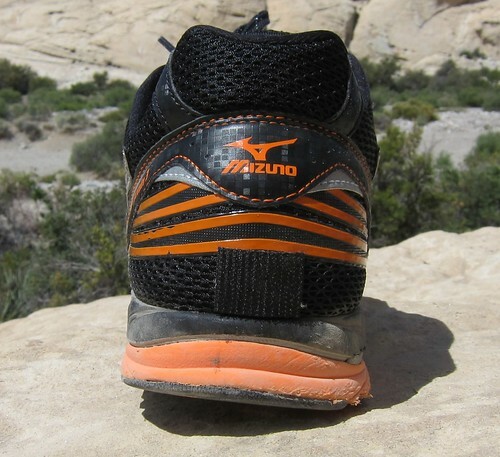 The front attaches with a small metal hook that goes under the front of your laces. This simple attachment works very well. You put on your socks, slide the gaiters on over them, and put your shoes on like normal. Slide the gaiters down and hook them in the front, then attach the back to the velcro and that's it. 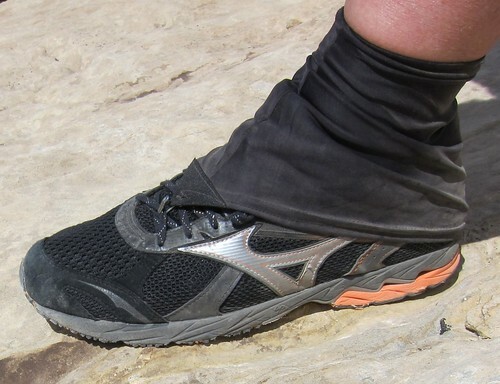 These simple spandex gaiters do an amazing job of keeping dirt and rocks out of your shoes, and your feet stay nice and clean. They breathe well and the pair weighs just 1.45oz for my enormous size. If you want to keep your feet happy, do what the Dirty Girls do and pick up a pair of these! Anyway, did you have any trouble getting the velcro to stick to the shoe, and do the Gaiters stay attached to the small piece of velcro pretty well? Dirty Girls are made for ultra marathon runners, so I don't think they would work with boots. The Velcro sticks very well, even to the mesh material on the back of my shoes. I would highly recommend them if you make the switch to running shoes. Update: The Velcro finally fell off while hiking in extended wet conditions in the Sierras. That said, I would suggest using some super glue or sewing the pieces to the backs of the shoes.